Into the light: Dr. Joanna Goldstein prepares for a program of pieces by well known and neglected women composers. (NEW ALBANY, Ind. )—When pianist and Professor of Music Joanna Goldstein takes the stage this Friday with a small chamber ensemble, it will mark a major milestone in a journey of academic, creative and political exploration. That journey includes not only the concert, but extensive research and the recording of women composers from the age of women’s suffrage. For many of these composers, Goldstein’s CDs are an act of artistic archaeology, if not resurrection, and their inclusion provides context to their creativity and impact during a time of social transformation. Beyond this, the recording, for which Goldstein was awarded an IU New Frontiers in Arts and Humanities grant, puts on display the talents of IU Southeast colleagues and capacities in a forward-looking project that expands our understanding of women’s contribution to musical culture. The project began when Goldstein, while doing research online about women composers, ran across a mention of a three-day festival of music by women composers that had taken place in Washington, D.C. in 1925. She was struck by the timing—in the heady post-suffrage days—and also by the diversity. “The program included orchestral pieces and band pieces and sonatas and arias, all kinds of music really,” Goldstein said. She sought to learn more, and found there was much more to be learned. For Goldstein, the end of the festival was just the beginning of a research expedition that has sourced music and information from the Library of Congress, New York Public Library, Library for the Performing Arts, various civic and college libraries through interlibrary loan, and even Ebay. She also delved into the research section of the IU Southeast Library as well as through the offerings of Hildegard Publishing, a press that specializes in the music of women composers. The result of all this sleuthing is a trove of music, much of which is new, and all of which is presented in a new context: a pair astonishing CDs, brought to life in two concerts. “In addition to bringing this music to modern audiences I was also trying to paint a musical picture of the era and these composers’ place within it,” Goldstein said. “Nasty Women” and “They Persisted” are the first CDs to gather the works of these particular composers together under a single umbrella. The project, reflected in the name, has a definite feminist intent, disrupting the established narrative of the history of composing, which is predominantly if not near-exclusively male. To record the music, Goldstein drew on the resources of IU Southeast colleagues Erich Stem, associate professor of music, advisor for composition for the concert stage/composition for film & media, and founder and artistic director of New Dynamic Records, and Tim Haertel, lecturer in music industry and advisor for sound engineering and music business. 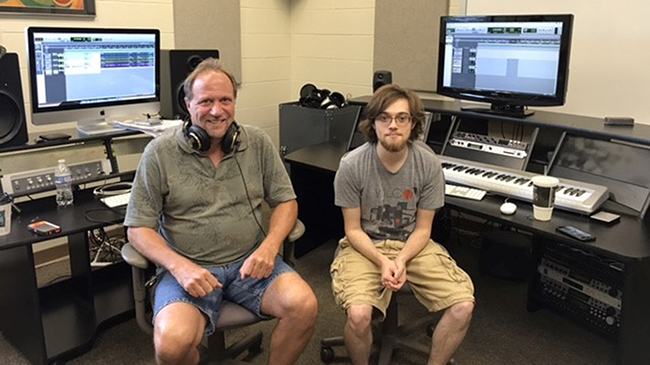 In addition, Mike Sauffer, a musician enrolled in the sound engineering program, assisted as an intern. The first CD, recorded last fall, contains pieces by well-known composers such as Amy Beach and Mary Howe, but also that of composers who have fallen out of view, such as Florence Price and May Aufderheide. Originally, Goldstein had wanted to recreate the 1925 playlist. But she began to see the limitations of this approach. Some of the composers featured at that concert hadn’t written for piano solo, only for voice. Or their works had become unavailable. In addition, she found other composers whose work proved to be interesting and even important, but who hadn’t been part of the 1925 event. So she expanded her view chronologically, settling on a selection of pieces from 1900 to the late 1930s. She also moved beyond the piano repertoire, to showcase ensemble works as well. The selection makes for a more comprehensive picture of what women composers were up to. Stylistically, the CDs span a tremendously volatile and fascinating period in music, encompassing late romanticism and the birth of modernism known through names such as Stravinsky and Webern. It was also a period that saw the development of radio and the influence of jazz on “classical” composition, as seen in the works of Gershwin. Recording any CD is complex, and the first of these proved no walk in the park, despite the fact that only one instrument was involved. The instrument is only part of the difference. Another has to do with performance practice. To find that place, Goldstein worked with Stem, a close colleague and collaborator with whom she had worked several times before, and with whom she shared a common outlook. Like a good editor or ghost-writer, Stem maintains the overview, a sense of the goals while liberating Goldstein to create. And create. And create. Part spirit-guide, part crew coach, Stem encouraged and cajoled, intervened and withdrew, sensing what needed to be done, when and how. “My role as the producer is to try to shape the entire piece and have a conversation about where, interpretively, we wanted to take them,” Stem said. The recording was live, but also not so live. Goldstein and Stem decided not to record the pieces in long single takes, but to record several of Goldstein’s renditions of each piece, and then edit together the best of each into a single flawless performance. “When recording a live performance, we found that when we played the whole piece, someone would always make a mistake, but the producer, and even the players, could never remember where and when the mistakes were made,” Stem said. Technology to the rescue! By cutting and pasting, a consistency is achieved that makes for a more even listening experience over the entire duration of the work. The challenge then becomes one of artistry. Both Goldstein and Stem value musicality over mechanical perfection. Getting that right is the challenge, and the ultimate success, of a good creative collaboration and a special alignment of musical chakras. It’s a philosophical point that Haertel wrestles with on a daily basis, and which serves up ample rewards when he wins. Haertel, Stem and Goldstein agree that the synergy of musical sensibilities is essential to creating a recording that lives and breathes. To make all that philosophical harmony into a CD, Haertel and his intern Sauffer had to overcome ambient buzzing from the Ogle Center HVAC system, chatter from Floyds Knobs cell phone towers—yes, they really can hear what you are saying—and cracks and pops from tungsten light housings as they change temperature. Haertel used some of this noise to his advantage, to create the “in concert” sound that classical audiences enjoy, by using older ribbon microphones, notorious for their capture of coughs and page turning. A convolution reverb program algorithm helped to control the ambient input. Condenser microphones did the heavy lifting with the music itself, and finding the best placement in the concert hall claimed a significant amount of time and energy. Tim Haertel and intern Mike Sauffer with some of the machinery used to edit Goldstein’s audio recordings. Once the music had been recorded, Haertel sent Goldstein a CD with the results. She listened and made notes, and the team then assembled in Haertel’s campus studio to move painstakingly through the recording, score in hand, and hone the final product. 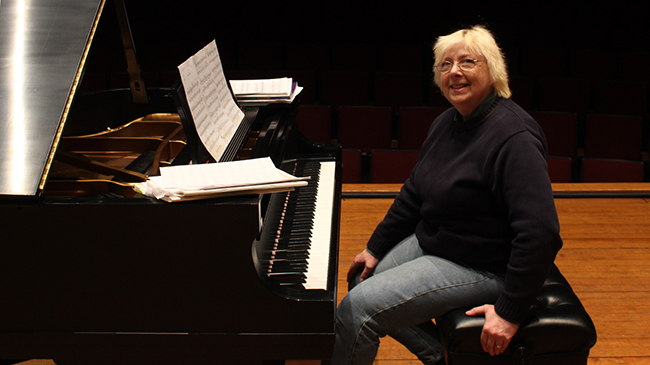 The second CD, encompassing works for piano and chamber ensemble, will also be recorded in the Ogle Center, in loose conjunction with the performance. Joining Goldstein for both the live performance and the recording will be Steven Moeckel, concertmaster of the Phoenix (Ariz.) Symphony, violin; Nicholas Finch, first cello of the Louisville Orchestra, cello; and Bruce Heim, faculty at the University of Louisville, horn. For Goldstein, the project is part of the larger conversation about women’s place in the arts, specifically music. Goldstein paused to allow the words to reverberate, as if sitting on a rest to allow the audience to fully digest the meaning of the atonal chord that has just preceded it. It was a very big pause. “It’s absurd,” Goldstein said finally. Absurd but indicative of a prevailing assumption. Even now, women are more likely to be performers than composers, limited to a few instruments. “It is important to validate that women create more than being domestic partners they were portrayed to be for so many years,” Goldstein said. “They Persisted” will be presented on Friday, March 23 at 7:30 pm in the Stem Concert Hall of the Ogle Center. Admission is free. The program includes the Piano Trio, Op. 150 by Amy Beach, the Sonata for Violin and Piano by Ulric Cole, and the Trio for Violin, Horn and Piano by Ethel Smyth. Joining Joanna Goldstein are Seven Moeckel, violin; Nicholas Finch, cello; and Bruce Heim, horn. Homepage photo: Dr. Joanna Goldstein relaxes during a rehearsal prior to her Nasty Women solo concert.